The sixth extinction crisis due to the industrial revolution – produced by the discovery of how to smelt metals more reactive than iron – has become a tragedy as Australia’s greenhouse emissions soar under no international pressure. However, it has recently dawned on me that, aside from Australia’s horrifically poor greenhouse gas emissions, there has been a major epidemic of poisoning in the Old World tropics that could very nearly compare in potential for extinctions with the mistreatment of Australia, even taking into account the secondary productivity being many times higher. It is well-known that Rachel Carson in Silent Spring exposed the potential for pesticides to kill birds, although the birds Silent Spring documented to be affected are very short-lived (averaging around 50 percent annual mortality) and hence their populations can recover very swiftly once poisons such as DDT are removed from the environment. Bald eagles are an exception, but even they live for an average of only five or six years in the wild. In contrast, Indian vultures lay only one egg every two years and have an average lifespan well in excess of the oldest known individual of small Enriched World songbirds – which for species with a million or more banding records is typically around fifteen years. The discovery by Lindsay Oaks in 2003 that diclofenac poisoning had caused a 99.9 percent reduction in numbers of three Indian vulture species – Gyps bengalensis and the recently split Gyps indiens and Gyps tenuirostris – over less than one generation thus dwarfs Carson’s work. Nonetheless, even in the 1960s Silent Spring was much better known than Lindsay Oaks’ writings are now, and with time that book’s fame has increased despite its distinctly specialised subject matter. Eleven years after Oaks’ groundbreaking vulture discovery, Darcy Ogada of National Geographic shows that the use of poisons to poach rhinoceroses and elephants on the African savannas is taking over from guns. Cyanide ion (CN–) has indeed taken over from guns, and Ogada shows it has the potential to create a crisis equal to that produced by diclofenac in India. As poisoning takes over from guns to kill elephants, Africa’s vultures face a decline similar to that observed in India when diclofenac was used to ease pain in dairy and draft cattle. 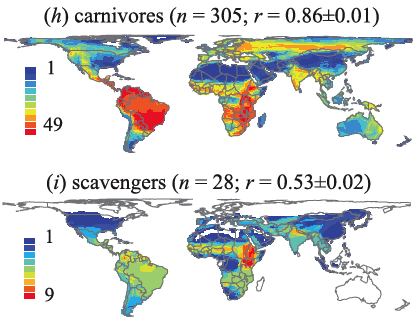 Species richness of predatory and scavenging birds. Note the high diversity in East African savannas. As elephants and rhinoceroses are poached more and more via poisoning, Africa’s large communities of scavenging birds face extinction in a very short time and it is likely less could be done than even India’s very moderate achievements in reducing sale of diclofenac, given the political problems faced by most of sub-Saharan Africa. Thus, there is the potential for entire communities of raptors to become entirely extinct with no survivors – and East African savannas have the world’s highest species richness of these birds, as can be seen from the attached diagram. Such a loss would be equal to the virtually certain loss – unless the Enriched World can eliminate petty policy quarrels and unite to demand a no-compromise zero-emissions target from Australia – of the supremely rich plant communities of southwest Western Australia to runaway drying of the winter climate. Like the devastation created by freeway-based transport and coal-based energy policies in Australia – instead of a plan for and vision of a continent with equal or greater mobility for every inhabitant without one single private motorised vehicle – poachers in Africa are producing a policy that will exterminate every large scavenger and possibly many large predators in addition to their “target” elephants and rhinoceroses. The consequences for this would be disastrous, because vultures in all but the coldest or most oligotrophic environments pay critical roles in destroying microbes that cause diseases like rabies in dogs and humans. 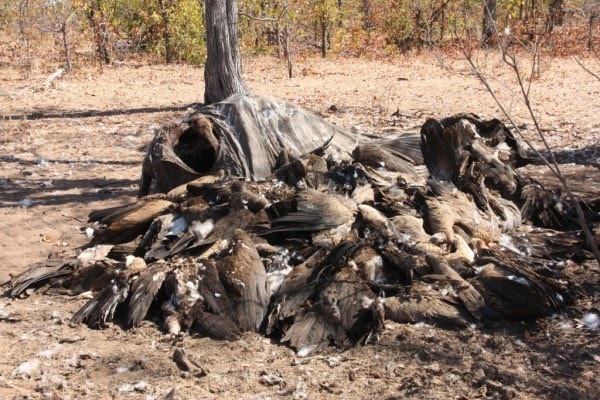 If Africa was to lose its vultures completely, it would face disease outbreaks that would be exceedingly difficult to control, since its resources are more thinly spread than India’s and it has much larger areas of wild animals that could potentially infect humans. There is also the possibility that other dangerous herbivores could grow in numbers without elephants and rhinoceroses – or that the many smaller species that have mutualistic relationships with elephants would also become extinct, multiplying the crisis. That the time to start on preventing mass wildlife poisoning in Africa – just as much as on making Australia pay the entire cost its appalling and worsening energy and transport policies have or will have for the climate of the rest of the world – is now. The Indian vulture crisis shows that, in the Tropical and Unenriched Worlds, consequences must be much more carefully considered than in the Enriched, owing to the orders-of-magnitude greater antiquity of their ecosystems. Is parking the problem for traffic and transit?